The T.R.A.F.F.I.C. conference heads overseas for the first time November 18-20 when Fabulous.com hosts the T.R.A.F.F.I.C. 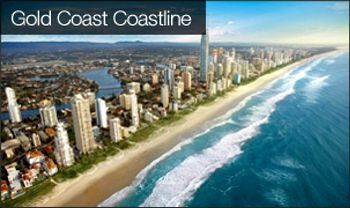 Down Under conference on Australia's famed Gold Coast. There will also be a pair of special activity days, one before the conference and one after. Fabulous has booked the scenic Sheraton Mirage Resort and Spa to serve as the show venue. 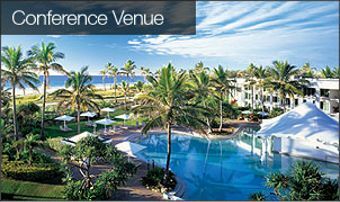 Gold Coast will host the T.R.A.F.F.I.C. Down Under conference Nov. 18-20, 2008. DN Journal: Fabulous.com had long been a fixture at T.R.A.F.F.I.C. and other major industry conferences. What led to your decision to stage your own conference in Australia and as a follow-up, why did you decide to run it under the T.R.A.F.F.I.C. banner? COO, Fabulous.com Dan Warner: Every industry conference that I attended would always lead to the same question from dozens of mouths, “When are you going to have a conference in Australia?”, and would inevitably be followed by “I’m so looking forward to when you do, I will be there!” Now it’s time for people to book their tickets! Australians have a very deep sense of love for our country and we naturally want to share that love with everyone else in the world. It was never really ever a question of if, but when, and now is the time. I can guarantee that there will never be another conference like this one again. We want to leave a good impression and let everyone experience what it’s like to be Australian. Everything is being done bigger, more elaborate, and excessive. Think domain conference on steroids! As far as why T.R.A.F.F.I.C.? Well, Fabulous has a history with T.R.A.F.F.I.C. that dates back to before it was called T.R.A.F.F.I.C.. The very first domain show was really a gathering of around 80 people in Hollywood in 2002. Dean Shannon founded our company, and as an avid user of Rick Schwartz’s domain board he decided with Rick that everyone should get together. So in only a few weeks time Dean and Rick got everyone together to meet at the Regent’s Beverly Wilshire hotel. That gathering was later fondly nicknamed “DeanFest”. Rick, as strong a personality as he is, prompted us to have another meeting for the next two years until he decided it was time to do it himself – and T.R.A.F.F.I.C. was born! Rick is a tenacious party animal that occasionally likes to rub cats the wrong way. In Australia, we like people like that. DN Journal: How did you come to settle on the Gold Coast location, which I believe is about a 60-90 minute drive from your headquarters in Brisbane? Dan Warner: The Gold Coast was an easy choice as its beaches are among the best in the world, it has access to a lot of the “extras” that we wanted to bring into the conference this time (like joy flight helicopters, paintball, zorbing), and the Sheraton Marina Mirage is a unique hotel (the only one built directly on the beach on the Gold Coast). It’s an easy place to work hard, and play harder. Brisbane is a great city for commerce, but the Gold Coast is the center of fun. Michael Robertson: For us, it will be the shortest journey we will have to make for a conference, which I’m looking forward to :-). As you mentioned, it’s only a short trip between the Gold Coast and Brisbane, where our office is located, so if anyone arrives early or extends their stay, feel free to stop by our Brisbane office and say hi. DN Journal: With the increase in the number of conferences being run each year by various promoters, it has become more important for each show to differentiate itself from the pack so that prospective attendees will know they will be getting a fresh product for their money. Aside from the stunning locale, what factors do you think will make T.R.A.F.F.I.C. Down Under a unique experience for registrants and what do you see as some of the highlights from the show week agenda? Warner speaking at the T.R.A.F.F.I.C. 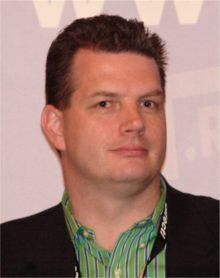 Dan Warner: The format is completely different to any other domain conference - including the traditional T.R.A.F.F.I.C. shows. 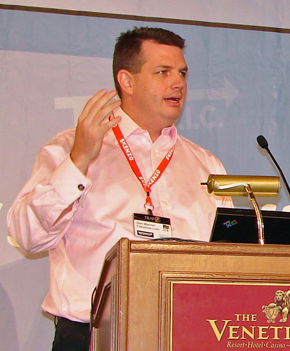 Sessions are grouped into major topical groups but every presentation stands on its own as a unique presentation. There are no panels! Speakers can only speak once, are required to use presentation slides or media, and are the one authority on their segment. Forget waffling speakers who don’t come prepared and often show up on the day not knowing they are on a panel. Waffles are for breakfast! Speakers were only selected on their merits and no degree of sponsorship could buy you a spot. Know your stuff, prepare diligently, and take pride in your topic. Professional, professional, professional. Add the CEO of ICANN and the Founder of WotIf.com to the menu and you have a powerful business catalyst. domain conferences have you been to that have a Conference Entertainment Plan? Here are a few of the things we are going to have going on: paintball, zorbing, go-cart racing, fire twirling dancers, snakes, koalas, wombats, cocktail bars, five star menu, illusionist comedian, “shrimps on the Barbie”, beach volleyball, helicopter scenic flights, jet boat thrill rides, aboriginal dancers, music bands, surfing lessons, wildlife parks, cruise catamarans, and fireworks! All in one of the most scenic locations in the world. 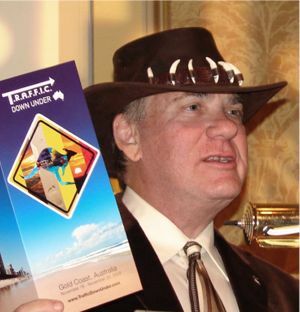 DN Journal: Australia has produced many of the key players in the domain industry and Aussies have been loyal supporters of industry events despite the burden of having to continually travel half way around the world for conferences that have been held primarily in the U.S. and Europe. Based on how your registration efforts have been going, are domainers from outside Australia signing up to repay the favor? Also, roughly what kind of percentage breakdown do you expect in terms of attendees from Australia/New Zealand vs. the rest of the world? Dan Warner: Domain conferences are always a little weird to deal with – a little like the people ;-) Most people sign-up at the last minute. Sponsors on the other hand are a reasonable indicator and we have had great support. Twenty two sponsors to date, and virtually every sponsorship opportunity is sold out. It’s still a month before the conference and I believe we have about 200 people who have actually paid for their tickets (Yes, they are real people). We get new signups every day and I expect a rush about two weeks out from the conference (make sure you apply for a visa online). Roughly, about a third are from the Australasia region. 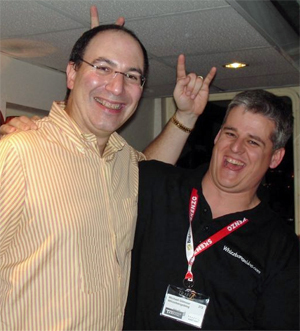 (at right in the photo above, clowning around with Larry Fischer) is among those who have registered for T.R.A.F.F.I.C. Down Under. weeks earlier. The room rates for the show were also very attractive. Despite the downturn in the general economy is this an especially opportune time to travel Down Under? Dan Warner: The Australian dollar is very favorable to the US dollar right now, and with the markets scaring people - plane tickets are getting really cheap. The exchange rate as I make this response is valuing the Australian dollar at less than 70 cents when only a few months ago it was nearly dollar for dollar. An Australian dollar still spends very similar in Australia to what a US dollar spends like in the US. So one very simple way to look at it is that you get another 40% for your money if you are lying on the beach here, rather than if you were in the cold in the US. Michael Robertson: The way I look at it, a lot of Americans and Europeans have Australia on their list of top places to visit. Having a work related conference to attend just sweetens the deal. Write it off as a business expense and spend a little extra time out here enjoying our beautiful country. 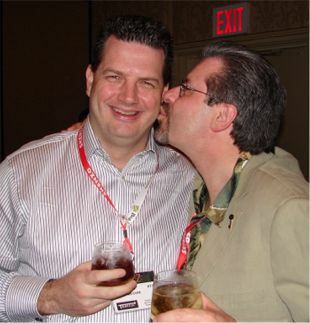 DN Journal: People go to conferences hoping to make new business contacts while also re-connecting with old friends. There will certainly be a lot of new faces at this show, at least from the perspective of those coming in from other countries. What can you tell us about how active the Australian domain community is and the kinds of people many of us will have an opportunity to meet for the first time? and everywhere. 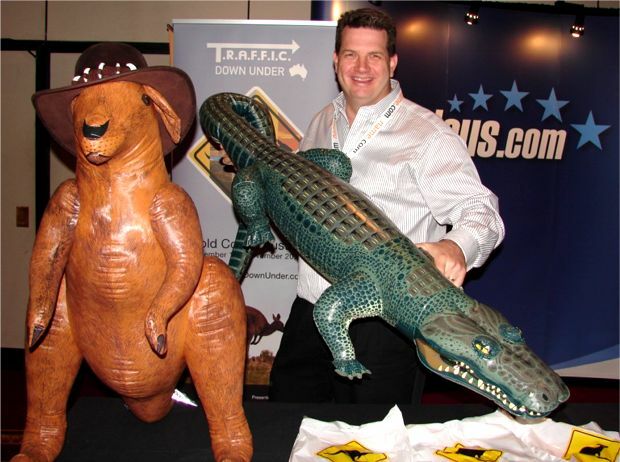 So you will see a lot of familiar faces - as we ride in to the conference on our kangaroos, drag in our pet crocodiles, and constantly talk about cooking seafood on a grill ;-) Australians are similar to entrepreneurs all over the world – with a little something extra. We have a black and sometimes odd sense of humour, spell differently (humour vs humor), drink excessively, love poker, and our country. We are very proud to be Australians. Australians are really not “in the box” or “painting within the lines” kind of thinkers. year to get people in the right frame of mind for T.R.A.F.F.I.C. Down Under. Michael Robertson: As Dan mentioned earlier, this is the first conference of this scale to be held in Australia. Over the years there have been a few localized events, but most have been informal get togethers in which a dozen or so domainers will meet for a bit to eat and a few drinks. We have actually been surprised be the number of Australian signups. We thought we knew all players in the Australian market, but more and more seem to be coming out of the woodwork to attend the conference. DN Journal: You have put in a ton of advance work on this event and a glance at the show week schedule shows exactly how ambitious an undertaking this has been for you. Conference staging is not your usual line of work and you have said this would be a one-time event. Give us some background on what has been involved in putting together a world class event like this. Also, if everything goes especially well whether could you be persuaded to do it again? Dan Warner: We have hundreds of man hours worth of internal labor that was spent just organizing the event. Every cent of the attendance fee and much more is being spent on the participants - it costs us more than USD $1,400 per person to pay all the expenses. I finally understand why Rick Schwartz would get so angry when people ask for discounts. We are giving back so much to the people who are coming that we should be charging far more, not less (any conference profits go to the Internet Commerce Association). It’s an extraordinary value, and this conference offers more than any other ever created. In Australia we do nothing by half! Although it is possible that we may have a single day event in the future, nothing like this will ever be done again. It’s a product of love and pride – not profit. Michael Robertson: I honestly don’t think we knew what we were getting ourselves into when we signed up to hold this conference in our own backyard. Having been to a dozen or more conferences myself, I didn’t realize how much actually goes into planning and executing a conference of this scale. We have made a conscious effort to be at every major domain conference this year and in everyone’s face letting them know about our show. We realize that it is a huge commitment to travel all the way to Australia, (we know, we do the trip up to 6 times a year), so we have to constantly be out there promoting the show in order to make it a successful event. I think if anyone knows how we run our business, Fabulous.com, they would expect us to put the same amount of passion, dedication and hard work into this conference. And they would be exactly right. A lot of time, energy and resources have gone into this event, from the initial conception to present day. Everything from sourcing a viable venue, planning the agenda, activities, speakers, email blasts, press releases, I could go on and on. I truly take my hat off to the various conference organizers that put on shows year after year. DN Journal: I think it is admirable that despite all of the work Fabulous.com has put into this, you have committed to use any profits from the event to support the efforts of the Internet Commerce Association. You have also set up a charity domain auction to raise additional funds for the ICA. Why did you think it was important to use your platform to help fund the non-profit industry trade association? Dan Warner: There are a lot of risk factors in the industry that cannot be addressed easily by any one company or individual. The intent of the ICA is to manage those risks for our industry through group representation. We think that it is important to support the ICA, so that we can all be unified and stronger through community and collective power. The ICA should strive to become the center of our communication network, our legal defense, and our public relations advocate. The conference also deals directly with many ICA centric issues in the presentations being offered. People should know why and how they can get involved. DN Journal: In closing, let me just open the floor for you to comment on any aspects of the show or the domain industry at large that you would like to touch on before we let you go. 1. Make this conference different, unique, extraordinary, and unforgettable. 2. Offer people value, which is hard to describe, difficult to replicate, and leads to tangible results. 3. 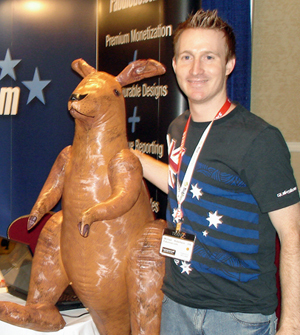 Showcase the wonders of Australia while offering networking opportunities and new relationships. 4. Instill a sense of community within domain owners and a desire to unselfishly communicate. 5. Offer efficient ways to communicate and profit. I think that we have definitely created a platform for these objectives to be accomplished. The rest is up to those who dare to take the bull by the horns, and travel to this unique conference in one of the best locations on earth. the fun factor will undoubtedly be off the chart. I have had a close up look at the Fabulous.com crew in action for several years now and nobody knows how to have a good time, and make sure those around them have a good time too, than these pioneering domainers from Down Under.